Available again for the first time in thirty years. Our amazing reprint. 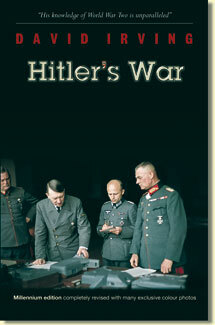 Updated and reaches the USA and Britain later this month. Be first to order now! 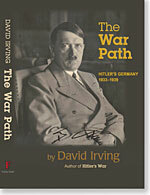 David Irving's standard work on the early years of Winston Churchill and his war, based, like his work on Hitler, on and interviews and documents exclusively available to him, and thirty years of research in British and international archives. This first volume chronicles an almost unbroken series of disasters in his life, from Gallipoli and the Chanak crisis to the defeat of France and the military fiasco in Greece. For collectors: Jacketed, case-bound, a limited edition of a de luxe boxed copy with special binding will be available to those who order it early. 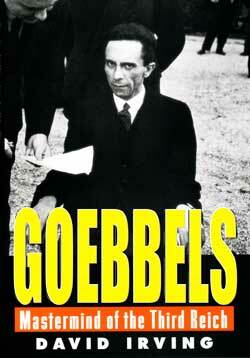 The contract for the biography was signed with major British publishers in October 1972. This first volume appeared fifteen years later, in 1987, the second fourteen years after that. It benefits from the release to the public domain of thousands of files, including the most secret, which even the official biographer has been unable to see. In the thirty years of its gestation, the world has turned, the landscape of history has shifted, and entire areas now tremble to the tread of the enforcers of political correctness. Unlikely but true stories dominate this volume: How Churchill clawed his way back into power; how he was used by the Jews, and used them; how he started the saturation bombing war; how he innocently but often exposed himself to young girls and statesmen alike; how he sank the Bismarck, and sold out the British Empire to the Americans; how his historic speeches were three times broadcast for him by ‘Larry the Lamb’, as he himself was in no condition to broadcast; how he dictated to and dominated his ministers; how his drink problem grew out of control, which did not escape the attention of foreign statesmen. 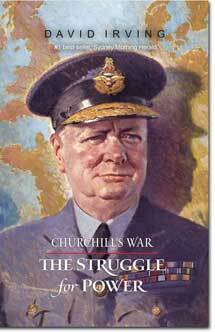 The human Winston Churchill reaches boldly out of this first volume, as from the second: bullying, bold, incorrigible, and callous, hectoring his own ministers but subservient to both Moscow and Washington and mindlessly sacrificing the British empire's interests when those powers so dictated. The unpalatable picture that emerges of this war leader in Real History is unchallengeable - that he willingly fomented, prosecuted, and indeed prolonged the war against Hitler, not in pursuit of any fundamental British empire interest, for Britain and her empire were never threatened by Hitler's Germany; but to acquire money and power after years in the wilderness and poverty; and that he was undismayed to see the British empire ruined in the process. The volume reproduces many photographs and documents, many in colour. Vol.2 has been published, and is available from this bookstore. Vol. 3 follows. 700 pages including notes and index. English buyers can obtain a copy for £35 incl. post and packaging, benefiting from lower postal rates. Send details to Focal Point, Holme Rose, Croy, Inverness, IV2 5PW or focalp@aol.com and payment by BACS to account 7300 7308, sort code 20-00-77.